I am not going to discuss the theory and applicability of a backpackable wood stove here. For that, go elsewhere. If you are interested in the lightest and most compact such stove currently available, read on. The Big Sibling is the lightest wood stove on the market because it dispenses with a lot of what makes a stove a stove, namely a floor and cooking surface. 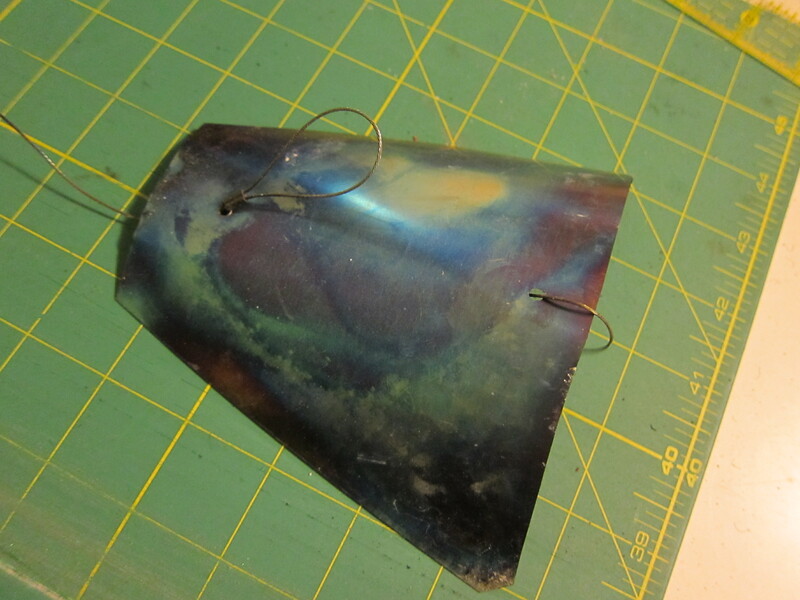 Instead, it’s a titanium cone capped by a damper, fed via a door (also made of thin ti sheet), and anchored to the ground by three ti tent stakes. The cone is 12.5 inches tall at the base of the damper, and has a 10 inch diameter at ground level. The body and door weigh 3.5 ounces, the damper 1.5, and the three stakes a further ounce, bringing the total to an even 6 before adding an appropriate length pipe. The whole arrangement, including a 5 foot pipe, rolls into a cylinder 3 inches wide and 15 inches long. The cone fits together via folds in the metal on each side, and a wire attached to the door laces through five holes to hold the whole thing together. A wire loop on the bottom of the door allows it to be raised for feeding. Putting the stove together is not complex, but is precise and a bit finicky at first. As befits an extremely light piece of gear (by which I mostly mean one abstracted beyond that which is conventional, to its essentials), there is a something of a learning curve before you come to the point of optimal efficiency. 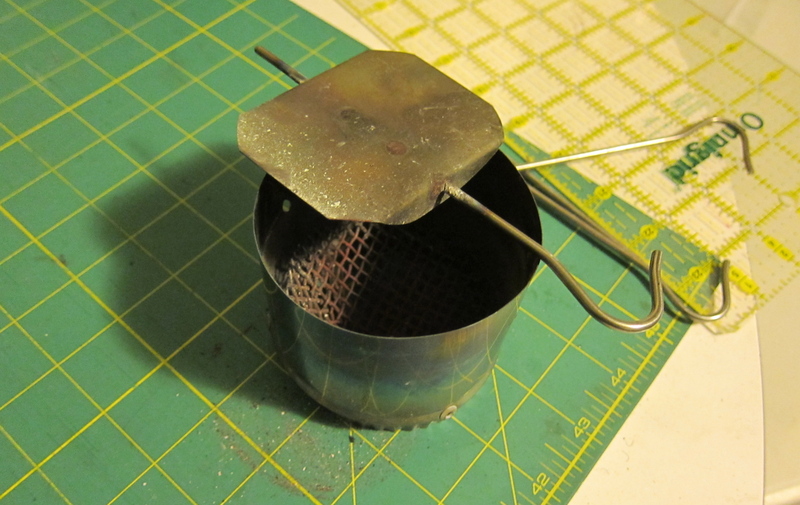 The damper has a wire mesh screen in the bottom, to act as a spark arrestor. The damper flap is welded on to a ti stake. Getting the flap assembly into the body of the damper requires a bit of trickery; thread the curved end of the stake through the hole on the side, slide all the way to the flap, then squeeze the damper body to flex it enough and allow the far end of the stake to get through. Easy and obvious once you’ve done it once. Drafting is allowed because the door is a bit shorter than the body of the stove, leaving a ~1cm gap. As can be seen and heard in the video below, this arrangement is extremely effective. Once a modest bed of coals has been built up, the Big Sibling will burn fast and very hot with the damper wide open. Damper control is very effective, and burn rate can be controlled widely and fast. The most acute limit of the Big Sibling is the size of wood it can be fed. 2 inch by 6-7 inch pieces are ideal, and to facilitate this a small saw or hatchet is almost mandatory for good performance. Even stuffed full of big, dense pieces of fuel of damped low, the Big Sibling will burn through its cargo fairly quickly. It is not a stove for heating your shelter all night while you sleep, it is a stove for cranking heat to drive off the cold and dry gear while you eat dinner, hang out, and get ready for bed. 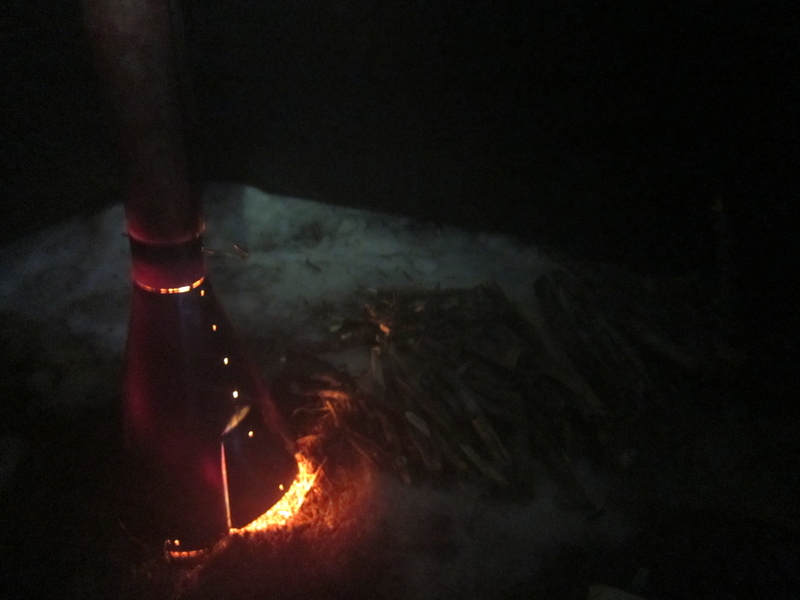 It can drastically warm a pyramid shelter, but will not allow for a lighter sleeping bag than you would otherwise take. The floorless nature of the stove naturally makes use on snow problematic. No doubt a metal foil floor atop green sticks could be arranged, something I’ve yet to experiment with. 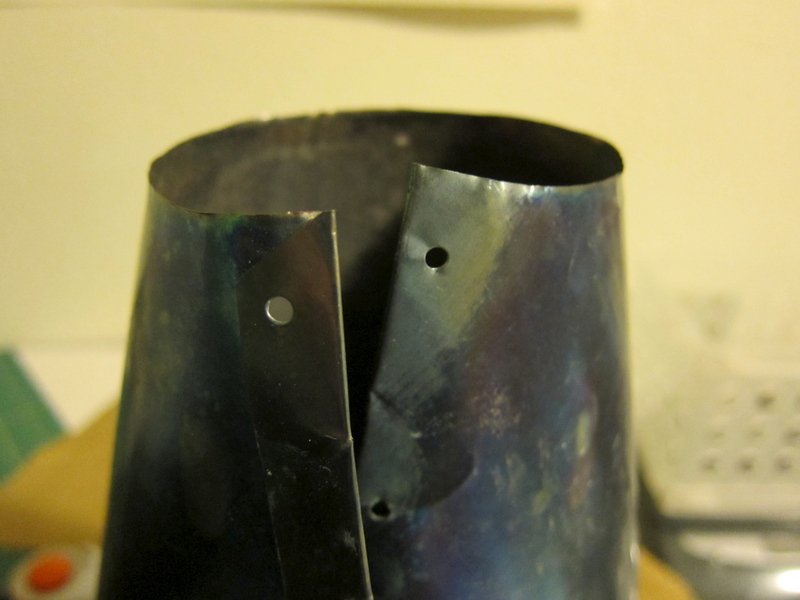 The only other limitation might be the relative fragility of the titanium stove body. The metal is thin and prone to bending if not handled prudently. I’ve no concerns about longevity, but it should still be handled with care. Overall, I could not be more pleased with this stove. The weight and space penalty are perfectly acceptable for all but the most light and fast trips, and after a modest bit of learning the functionality is impressive. Outside summer, and the most weight-sensitive trips, it should get a lot of use. 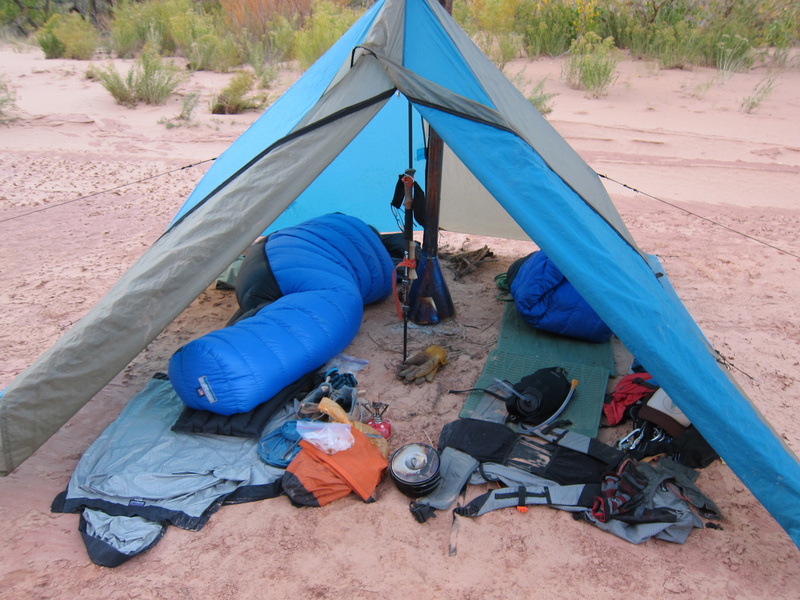 I would absolutely hate backpacking if I laid in the dirt along with all of my gear. No thanks. Actually it’s not dirt, it’s sand! I have a Seek Outside U-turn stove. It’s certainly not a fool proof setup, and the stove, pipe, a small saw, and a light pair of leather gloves weighs in at 1 kilogram, so it’s not exactly light. That being said, the ability of this stove to transform damp and chilly into dry and warm is worth every gram. Especially when I’m out with groups of kids – whether my students or my own boys. I’ve been able to get a two hour burn in my stove – plenty long enough to dry out a few groups of wet kids. Have you boiled water by putting the pot if front of the door. I’m interested in how well that works. I don’t bring a saw or hatchet. I go caveman style , or what what I call the 3 rock system. Two rocks on the ground supporting each end of the stick that need shortened , then throw 3rd rock down on the stick in the middle. No serious injuries yet….. I haven’t bothered to try. Seems like it would screw up the draft and make the burn less hot/efficient. A question – do you ever feel the need to use the rain cap for the chimney? My outings have all been dry so it hasn’t been necessary. An extra $25 seems a bit steep for a new one – I suspect a person could improvise something out of aluminum flashing that would be light and functional. For backpackers interested in optimizing packweight and performance, is there an article about the relations between shelter volume, firebox volume, outside temperature and burn-time? It would be great to see a technical explanation for the laysperson. Not that I’m aware of, and I’m reasonable sure I’d know about it if it existed. I’ll pass your request on to Kevin at Seek Outside. There are a ton of variables and for those reasons an especially scientific comparison is not practical, but some general suggestions would be helpful. I was just thinking the size of the stove is dependent on the time of the year and limitations of the environment. One wouldn’t recommend the same stove used for hunting sheep in the alpine Montana in September as say in middle of December in northern Saskatchewan.